Hi guys! Posting my first topic here, hope you guys will join in. Well, recently I've been thinking about this whole concept about what Bhakti Natya actually is. There is a bharatanatyam teacher that my mom called and asked if I could join her lessons. She said she teaches Bhakti Natya. I did not have a single clue as to what that was. The only bharatanatyam classes I had attended were from the class of Kalakshetra, the most common type of bharatanatyam. And so I started researching. I typed Bhakti Natya and found all sorts of articles related to various things in Hinduism but nothing concerning bharatanatyam. Then I added the word bharatanatyam and came across an article on Natya Yoga. It described bharatanatyam in great detail, like explaining the three types of dance: Nritha, or dance, Natya, or acting, and Nrithya, a combination of both. Did you guys know that bharatanatyam is actually from the Vedas? It is a part of the fifth Veda, Natyaveda, created by Lord Brahma for the enjoyment of mankind. Natya Yoga uses elements of Yoga and dance to teach bhakti. And I guess that's why it is such a big deal in ISKON. And they also perform pieces on hindu stories, especially Krishna. Well what do you guys think about it? Is it surprising that dance is such a big part of Hinduism or not? Here's the link to the site. It also is marketing their DVDs so I found that a little disheartening because it said the information would be fully explained only if I buy the set. (If you notice, the page is decorated with pictures of famous bharatanatyam dancers like Harini Jeevitha). Thanks for sharing all the info Aishu, very interesting! I learnt a lot! 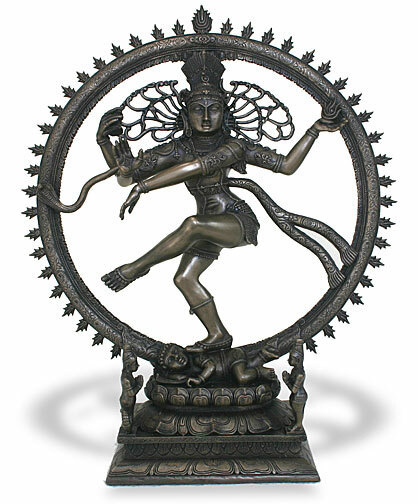 To me it's not surprising that dance plays such a big part in Hinduism...because its a lot more than just mere dance! When done with the right emotions and dedication it transcends into like your article mentioned an expression of devotion/ oneness with God...like Shri Krishna doing Raasleela with the gopis or Natraja doing Tandava. A fundamental text of Natya is the ancient Gandharva Veda, a supplement to Sama Veda. A section of gandharvas called apsaras are the celestial dancers at the court of Indra (the world of the higher buddhi). The occasional incarnations of apsaras helped bring Natya to the physical world. Yes exactly! And the way I see it, anything can be done in a form of bhakti and become divine. Music, dance, literature, and service, etc. As you said, even the gods took part in this. Thanks for the info, Aishu! I learned Bharatanatyam for six years when I was younger, but my teacher moved out of state and when I found a new one, I did not like her because she commercialized dance and I could not find the same bhakti in it as my first teacher infused. The new one was all for outside performances and recognition, and she did not teach us much Bharatanatyam beside what we learned to perform outside, while my original one really infused this Bhakti Yoga in it, I missed her for a long time after she moved! Sure Asha do continue, I for one would love to read more! @Janaki di, wow, i'm so sorry! I think that Bharatanatyam is simply for self enjoyment and bhakti! It should definitely not be commercialized. My old teacher was such an angel too! She would explain the hindu stories behind the dance, but she never pushed it as there were Christians and Muslims in our class too. She was like an aunt to me! Missed her so much when I moved! Hope my new teacher will be just as good. @Asha, wow please do add to this! I would love so much to learn more! I agree with you Aishu, Natya Yoga and Sangeet are areas which should never be commercialized because of their religious significance, the meaning is lost when they are. I hope you find a good teacher too, just keep looking hard and read up on their reviews so that you do not get a commercialized one like me. Usually you can tell the first few months how they are, and if you do not like them you can always quit and look for another one. So how far have you gotten in your classes? When will your Arangetram be?